For years, capnography has been used in the hospital setting to monitor airway and ventilation in the operating room as well as in the critical care environment. Unfortunately, for the most part its use has been limited to that setting by many issues, including overall awareness of the importance of capnography in pre-hospital settings, training, practice protocols, data collection, and capnography devices that aren’t portable or rugged enough for field use. Technology has advanced, and manufacturers now offer highly portable capnography monitors that are built to withstand the rigor of the pre-hospital environment. Combined with medicine’s more broad and accepted understanding of the true value of etCO2 levels and waveforms, we are seeing the use of capnography migrate from the hospital into the critical, at-initial-patient-contact environment where we in EMS provide care. EMS1.com recently visited one agency that has been an early and careful adopter of capnography in the pre-hospital setting. We discussed their use of capnography technology in the management of their patients, and asked them to describe what they’ve learned in their years of utilizing etCO2 to help create better outcomes for a variety of patients. Michael McEvoy, PhD, NRP, RN, CCRN, is the EMS Coordinator for the Saratoga County, NY EMS, along with serving as the EMS Director of the NYS Association of Fire Chiefs, and as the Resuscitation Committee Chair at the Albany Medical Center. He’s also a paramedic supervisor for his home service, Clifton Park & Halfmoon EMS, where he’s also served as the acting Deputy Director of EMS for the past year. During our interview, Dr. McEvoy provided insight into how that agency is bringing the full benefit of capnography capability to patients. Q: Mike, thanks for talking to EMS1.com today. What can you tell me about how Clifton Park & Halfmoon EMS is implementing capnography in patient care, perhaps starting with a bit of background on the agency? A: Glad to talk with you. We are a combination department, with about 70 paid and many more volunteer members, and run about 6,000 calls for service in a year in a mixed environment of semi-rural, suburban, and urban areas, with a mixture of dual-medic and PB configuration units. When capnography first became available about 15 years ago on some models of ALS monitors, we decided to become adopters of the technology in the sense that it was used then, namely for verification of correct endotracheal tube placement during intubation, and subsequent ventilatory status. That role has been utilized by many, not only through monitor-based capnography, but more recently by colorimetric disposable devices, which basically give a yes/no indication of whether or not you’d had a gastric intubation, and subsequently some indication as far as whether or not you were ventilating adequately. 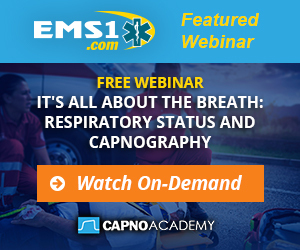 In recent years, however, the clinical implementations of capnography have become much more varied as new research comes about that lets us make informed decisions about how to utilize it as part of patient care from the initial contact on up. We are now using it on non-intubated as well as intubated patients — the insight that it gives us into circulatory status on spontaneously breathing patients allows us to titrate our treatment in many ways. The most common example of this is in the titration of CPAP treatment, where we utilize in-line capnography to monitor the status of their airway and perfusion by watching the capnograph waveform not only in a real-time sense, but also on the monitor screen and through reports built into it, showing trends over time. That allows our ALS providers to determine not only current status (which is what we’ve been able to do historically), but also the efficacy of their treatment as identified by the trending shown on that historical graph. Q: So capnography can be used as a diagnostic tool as part of the provider’s assessment toolkit? How about at the BLS level? A: Absolutely. Our BLS providers are not currently utilizing capnography, but it’s in the curriculum, which means that even at the earliest stages of formalized assessment, patients may soon see capnographic results applied to their treatment — early recognition of the need for ALS care becomes possible for a lot more patients, possibly even before they get to the point of actually needing urgent intervention. It also has applicability in the cardiac arrest scenario in a very important sense: etCO2 levels may be one of the earliest indications of ROSC, which can dramatically change treatment towards supporting that spontaneous circulation once it occurs — that’s something that has applicability in terms of BLS in the sense that those providers may be able to be trained to watch an at-BVM capnography readout for trends, to help identify that moment of ROSC to our already-very-occupied ALS providers. It can also identify how effective your compressions are by helping to measure cardiac output and perfusion via the level the capnograph is registering. Q: What kinds of uses are you seeing now for capnography in your agency among your ALS providers? A: Right now, capnography is being routinely utilized by our ALS providers — up to about 1/3 of the patients they encounter are having it applied to them. One common example is that we are using it for continuous monitoring of seizing patients, especially those to whom we have administered benzodiazepines. In the actively seizing patient before benzo administration, we can determine whether or not they are breathing adequately on their own (which is otherwise hard to tell due to the seizure activity). After benzo administration, we can compare to pre-administration etCO2 levels to ensure that the medication administration has not resulted in respiratory depression to a point where it compromises adequate perfusion. Incidentally, as a result of using capnography regularly in seizing patients, we were also recently able to see a differential-diagnosis scenario as well, where it was applied to a seizing pediatric patient — or so our providers thought upon arrival — but it was actually determined that the patient had a respiratory rate of over 100 and was in fact having an anxiety attack as opposed to an epileptic seizure. Our ALS providers are also using capnography in scenarios where a patient is having severe (or pre-severe) dyspnea. The capnography waveform can identify and help to differentiate the causes of the shortness of breath by giving us an indication of reactive airway disease even before the typical increased expiratory phase begins from a physically-observable standpoint. The patterns can also indicate cardiac output, as well. Based upon these results and data, our providers are able to make a much earlier and more educated decision on whether or not to intubate the patient to protect their airway, or due to perhaps impending respiratory collapse. Overall, capnography monitoring factors into many different types of assessments that our medics are performing, including evaluation of septic patients (such as patients who are diabetic, as we may be able to identify DKA), and trauma victims, feeding important information into the clinician’s entire picture of a patient’s health and status. We had an 18-year-old patient a few months ago where capnography identified hypovolemia very early on in his care, for example. Q: That’s quite a broad subset of patients who seem to be being helped by your agency’s use of capnography. What about the future — where are you seeing capnography in the equation of patient care for your providers? A: Overall, our agency is transitioning away from solely providing emergent out-of-hospital care into really becoming more of a community health resource. The idea is to provide a full scope of care at home for the patients in our service area, beyond simply responding when they are critically ill to prevent them from becoming so in the first place. With capnography, along with all of the other tools in our increasingly-expanding ALS repertoire, we hope to be able to identify trends in our community as well as getting a better overall picture of the health of individual patients, and so provide better care for all of our service area in a truly end-to-end sense.